This blog’s featured item is “Yeti, Podcast #1, and an Excursion into Old Technology.” You may know all about the yeti, but when I write about ‘Old Technology,’ I refer to Ancient Technology. Then there’s a brief piece that explains those cars and trains of mine you might have spotted on the Internet. Finally, there’s a reminder that history is all around us, all we have to do is observe. “Crossing a Path of History” is for people who travel in and around Chicagoland, but it refers to the features that abound around all of us, if we take time to check it out. Before attempting to enter the Never-Never world of movie scripts, caution is advised. Thousands of scripts flood studios, from stars and directors, other studios and producers, from freelancers known and unknown. Syd Field, author of Screenplay, says he recommended only a few of the 2000 he read while heading a Hollywood film company’s story department. “…[O]nly one out of a 100 screenplays I read was good enough to consider for film production,” he says. That, despite the firm’s production of over a hundred films a year. This suggests that only those possessing specialized training, great experience, and insider knowledge—not to mention gumption—should attempt a screenplay. Besides the discouraging words of experts, there are a ton of other reasons not to write a screenplay. Take the lingo, for one. Almost every scene heading must start with either INT. or EXT., which you might think stands for Internal or External. No, those stand for INTERIOR and EXTERIOR. But don’t ever spell those words out—only the three-letter abbreviations, capitalized, are accepted. Certain other abbreviations—like P.O.V.—are approved, but you must know which ones may appear and which may not. Rules abound. Scene headings must include either DAY, or NIGHT. If you substitute THE NEXT DAY or LATER THAT NIGHT, you’re labeled as unskilled and your effort will most likely be rejected. All screenplay text must appear in a specialized Courier font, sized at 12-points. The first line of text must appear on the seventh line from the top of each page. After the title page, every script starts with “FADE IN.” This means a black screen becomes illuminated with an image. As you know, every movie begins with an image brightening the screen. Thus “FADE IN” may strike you as exactly opposite the usual meaning of the word “fade.” And so it goes. One more thing: since every script starts with the words “FADE IN,” couldn’t we just assume them and begin the first scene? Most instructions for writing a screenplay say a script is not designed to be read—after all, it’s understood to be only a blueprint or plan for how a movie is to be constructed, not a story to be read like a novel. Because of the screenplay’s clipped language, lack of detail, and strict rules, these stylized documents are as much a barrier as they are a guide to the movie they represent. Paradoxically, however, no movie is ever made without first having appeared (and been read) as a screenplay. To help the unexperienced scriptwriter navigate this world, one article suggests analyzing the screenplays of great pictures—The Graduate, Casablanca, The Godfather—then watching the video. But needless to say, you can’t analyze a script written for a yet-to-be-made movie by watching the video. Often we think we could write a better movie than those appearing at the local Cineplex, or on late night TV. But that means joining the Never-Never world of screenwriting. I thought “yeti” was another name for the furry creature that has been thought to inhabit the Himalayan wilderness. But no. Our first podcast proved to be both an excursion into the unknown with Yeti, and an exercise in Old Technology. Anya and I were scheduled to be interviewed by the very kind Julie Eason, proprietor of the internet’s The Successful Author Podcast. We prepared by consulting an audio expert friend. He said the microphone in a typical laptop would yield inferior sound and suggested the audio quality of a Skype connection would be improved by using a high-quality mike. He recommended the Yeti, made by Blue Microphones. We bought the Yeti, a handsome USB mike that came with a stand allowing it to be set at any desired angle. Together with its stand, the impressive unit is about a foot high, weighs about three pounds and produces excellent voice quality. Setting up the Yeti to operate with our laptop and Skype, however, was not within our technical capabilities. Another friend—plus a relative of that friend—rescued us by devoting some time to decoding the laptop’s setup protocol. Finally we were able to successfully test the Yeti on Skype. A few days later we learned that the interview was to be scheduled over the telephone rather than via Skype. Again, our audio expert helped us out. He said a remote recording of us on a cell phone would yield audio inferior to that on a POTS line (Plain Old Telephone Service). POTS refers to the old-fashioned transmission of voice over copper wires. It restricts frequencies to a narrow range of 300 to 3300 Hz, called the voiceband, much less than the human hearing range of 20 - 20,000 Hz. It’s been around since about 1876. Despite being Old Technology, POTS apparently remains the basic form of residential and small-business connection to the telephone network in the U.S. and most of the world. So, advancing forward via a retro service from the late nineteenth century, we nervously participated in the interview. If you dare tuning in, it’s on http://successfulauthorpodcast.com/50/. About those Cars and Trains . . .
Eagle-eyed searchers on the Internet often see Internet artwork attributed to me, or sometimes, to “Revard,” or some other misspelling. Most often these are color images of autos and trains, specifically ‘classic’ cars and steam locomotives. Usually these appear for sale on auction sites, ebay, and similar websites, oftentimes framed. These are sometimes labeled by the seller as “paintings,” “lithographs,” or “etchings,” in an attempt to persuade buyers of a high value. However, it’s important to understand these offerings. Back in the mid-seventies, a New York entrepreneur, Arthur A. Kaplan, approached me. He had seen one of my paintings on exhibit, and asked if I’d be interested in doing a series in a similar vein. After some discussions about what he had in mind, I agreed. 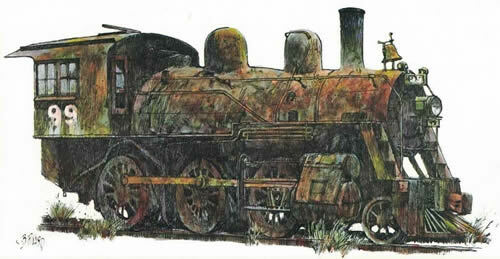 Over a couple of years, I produced two series of paintings for Kaplan, four classic automobiles, and four old steam locomotives (example shown). These paintings were drawn in pen & ink and acrylic paint on board. The original paintings were shipped to Kaplan’s company in Manhattan and subsequently printed on paper using modern reproduction techniques. The paper reproductions carry the label “Litho”, and were sold in quantity in home décor and department stores throughout the United States. I earned a dollar amount based on the number sold, but I can’t recall now exactly how many were sold. Confusion may arise from the fact that some of my original artwork (drawings, paintings or etchings) may, from time to time, appear for sale on the Internet. What you should know about these eight different prints of cars and trains is that they are decorator pieces, not original art. My signature was printed along with the image, but these are not original paintings or etchings. They should be priced similarly as other printed reproductions of paintings. As for the label “Litho,” this simply means they were printed using a lithographic method, not from lithography on stone (or other ground) produced and signed by the artist and subsequently printed by a workshop for sale in art galleries. This use of the term “Litho” is confusing, which is why it sometimes leads to deceptive advertising. For what it’s worth, Arthur’s company, Arthur A. Kaplan Co., Inc., founded in 1956, is no longer in business. The boy turned very quiet. --Lara Flynn Boyle is a TV and movie actress from Davenport, Iowa. NOTE: This item is aimed at Chicago-area readers.Others may find it of interest. – J.B.
Did you know that if you drive the Kennedy Expressway you cross a path of history? And if you ride the UP-NW Metra, the Milwaukee-District North, or take the Brown or Blue Lines of the ‘L’, you cross a path of history? If you travel the loop on the ‘L’, or take the Pink Line through Lawndale, you cross a part of Chicago’s history. If you commute on the UP-W Metra or drive the Eisenhower Expressway, you pass near a memorable occurrence of 1933. If you sometimes drive Ogden Avenue, you may cross its intersection with Cermak Road. That crossing’s not far from 2348 S. Millard Ave., where Anton Cermak lived while mayor of Chicago. That’s also where, on March 8th and 9th of 1933, hundreds of mourners passed by Mayor Cermak’s body as it lay for viewing after its long journey from Miami, Florida, where he’d been shot. Today, the Pink Line ‘L’ passes very close to Cermak’s residence in Lawndale. The Mayor’s body, in a bronze casket aboard a Florida & East Coast train, had on the 8th, arrived in Chicago at the 12th Street Station. As a gentle rain fell it was loaded into a hearse draped with black and purple banners, then escorted north on Michigan Avenue by motorcycle police. At Washington, the solemn procession turned west out of the loop toward Sacramento Blvd. Today, the westbound UP-W tracks, and the Eisenhower as it strikes to the northwest, each cross this path in the Cermak story. Chicagoans sometimes forget that Mayor Cermak died as a result of the attempted assassination of Franklin D. Roosevelt. It all happened about three months after FDR had been elected President in 1932. Giuseppe Zangara, a troubled Italian immigrant, fired five shots at Roosevelt in a Miami park. FDR had just concluded a short speech before a large crowd at which Mayor Cermak was a guest. Fortunately, all the bullets missed the president-elect. But one of them struck and wounded Cermak, who survived for nineteen days before dying. Two days after the body’s arrival from Miami, a gigantic procession with the mayor’s casket slowly wound its way twelve miles north from the funeral at the Chicago Stadium to the Bohemian National Cemetery at Pulaski and Foster. There, the mayor was finally laid to rest, not far from today’s Kennedy Expressway, the UP-NW Metra and the Milwaukee-District North tracks, as well as the Brown and Blue Lines of the ‘L’. Next time you’re traveling, you might consider the ground beneath you. You may be passing a significant address or crossing a memorable path in the history of Chicago back in 1933.
offer and exchange opinions about the characters, the drama, and the history of Chicago in this unique novel. Hurry – Others are signing up right now! A tip of the hat to those who take time out of their busy day to read my blog. Tell your friends to visit this website—they’re sure to find something of interest! ©2015-2019 J.B. Rivard. All rights reserved.